A 73-foot Englemann spruce arrives at the Capitol. Washington (CNN) - The official Christmas tree of the U.S. Capitol arrived Monday and will be illuminated at a ceremony on December 4. Dozens of tourists, Capitol Hill staffers and news crews watched the tree's arrival along with Stephen Ayers, the Capitol architect. "My job is to officially accept the Capitol Christmas Tree on behalf of the Congress," he said. 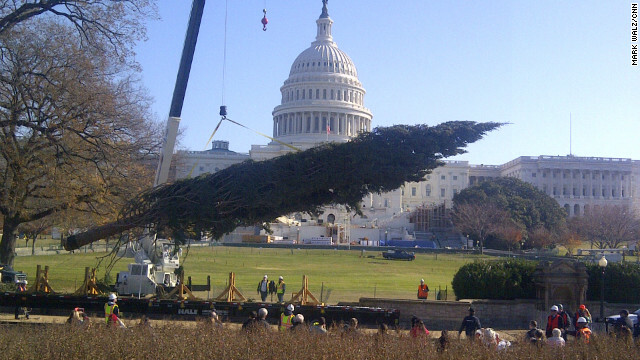 U.S. Capitol crews using a crane hoisted the 73-foot Englemann spruce from a flatbed truck and prepared it for display on the West Lawn. Once the tree is mounted, U.S. Capitol workers will place ornaments crafted and donated by Coloradans and will string energy-conserving LED-type lights on it. Everyone always dreams of a white Christmas we have all heard the song of Babyface a White Christmas while shopping for the good old Christmas tree, as this song is being played on the radio station. Christmas in America is a time where all of us should stop and be grateful with being with our loved ones. Christmas is not just about receiving presents or getting the latest clothes from our grandparents, it's a time to give thanks and share some Christmas joy with our family's across America and the world. Donny Hataway who has the song This Christmas believes that Christmas should not be all about the presents, but in America we should stop for a few minutes and help out people who are less fortune then us and share in the Christmas joy with everyone across America and the world for years to come. Good story Paul. Miss talking with you in the field. I am surprised that the atheists aren't all Ebenezer Scrooge over this. They are trying to kill Christmas and anything related to it everywhere – schools, parks, universities. We love Christmas trees, why don't you leave our pagan beliefs alone you atheist religious freaks! Nuthin but a big lump of coal for you this Christmas! I am amazed at how many of the exact same arguments are replayed on CNN's religion blog comments section no matter what the topic of the essay is. lol. You may be vocal my friend. But you are in a minority of the global population. Christians are so brainwashed you have to repeat yourself over and over again. And so they say of atheists. You couldn't come up with an original thought so you have to copy mine, more proof you're brainwashed moron. They don't say that of atheists. I broke from the brainwashing when I was very young and never looked back. No one has ever said that I am an atheist because of any brainwashing. in fact, I know I am an atheist DESPITE the brainwashing. My mind is stronger so the brainwashing didn't take. Tom, i have never read one cogent argument on this blog either against religion or for atheism. Here here! I totally agree. Agreed, but I haven't read one against atheism or for religion either. Freeking waste of tax payers' $$$$. Can't pray away the waste. It provides a good teaching opportunity to inform people of the pagan roots of the custom and the absurdity of religion. And there's nothing wrong with them once they are stripped of their religious meaning. Where are the atheists evangelists to decry this outrage??? Christmas trees have the word "Christ" in them. We can't have them on government property. Or "Christmas" carolers or happy people of any sort. You ever think that Atheists are the new Ebenezer Scrooge? Did you ever think you were such a big punk? Look, us atheists don't care at all about christmas trees. They are pretty and I have many fond memories of decorating them etc. What we can't stand, is you fundies trying to attach some religious meaning to it, and then forcing us to go along with it. We have an issue with our government having this seperaton of church and state, but then during the month of Dec there is this quasi nod to it, using tax payer money. If left to you own devices, and if you fundies were in complete control, you would make it a crime NOT to attend church, and your religion would be mandatory and we would not have a supreme court but a "council of elders" making all laws based on the babble. They are doing the same thing over in the middle east with their brand of fundie, and look at how it is working for them. We don't want that here. Muhammed Ali, Absurdity of troll-ism, hind, ignorant. LOL! Love it, good one Muhammed! Atheists are just scrooges! Still too long and too boring. And you just copied and pasted that from someone else. Get some original material and stop being a follower and get up off your knees, you don't have to be a herd animal. Maybe the Corner Cafe can add that to their menu. "Still too long and too boring". – like mass on Sunday. Jesus like many was in the right place at the right time. There was a lot of economic-driven assistance and "necessary accessories" without which Jesus would have been just another forgotten Jewish radical. Paul of Taurus was first of the "necessary accessories". He recognized early on the great wealth of Roman and Greek Gentiles so he wrote his epistles raising Jesus and his embellished life from the dead and the Gentiles "ate it up". His promise of the imminent second coming was shear brilliance in gathering much silver and gold (the prime necessary accessory). The Romans got jealous ending the life of the first necessay accessory. Pilate, although not the founder of Christianity, was another "necessary accessory i.e. he could have easily sent Jesus to the salt mines. Constantine and his swords finished the "necessary accessory" scenario. Conclusion: Said tree should be called The Tree of Necessary Accessories". why not just grow a tree and decorate it every year, that why you wont be killing a tree and hurting the environment. heir is no need to subjugate nature for a display of reverence of nature, its oxymoronic. Seriously???? What you are proposing is common sense, environmentally sound, financially responsible and above all, logical. Now really, when has our government been any of those things? "The U.S. Capitol's Christmas tree dates to 1964, when then-House Speaker John McCormack helped plant a live evergreen on the West Lawn, calling it "The People's Tree." Unfortunately, the tree failed to thrive, and in the years since, the U.S. Forest Service has provided a cut tree that's at least 65 feet tall." They can come get the one out of my yard that just won't freaking die! Sumbish is about 25" tall! "Congress shall make no law respecting an establishment of religion. . ."
"The official Christmas tree of the U.S. Capitol"
"Stephen Ayers, the Capitol architect. "My job is to officially accept the Capitol Christmas Tree on behalf of the Congress," he said." Where's the official Hanukkah Menorah or reading of the Kwanzaa Kawaida? When was the "official" congress Zakat for the poor on Eid Al-Fitr after Ramadan? When does congress cook their "official" Pongal to celebrate Uttarayan? We must admit that we are neither a country free for all religion nor free from all religion and that American Christians are some of the worlds biggest hypocrites. Please get your disgusting religious celebrations out of my government. Did I miss something. I don't remember reading anything about a "law" being passed that requires them to have or Not have a Christmas tree. They are simply choosing to recognize the holiday by erecting the Christmas Tree. They simply CHOSE to do this in much the same way they choose NOT to display a menorrah or any other holiday symbol. No law, just choice. Really, must you complain about every little thing. It seems you have to invent something to argue about. It's really annoying. Hypocrites you say? Let's take a poll, shall we? How many atheists celebrate Christmas (Exchange gifts, take the day off work, visit family, sit around a big dinner) Wow, that many? Now that's hypocracy. Funny, I thought "Celebrating" christmas involved going to church, praying etc... That's very different from say, taking off work which we don't really have a choice because everyone else has and the office is closed, a lot of people may or may not exchange gifts but that is hardly "celebrating" christmas as much as observing the holiday season. I will say though, there isn't a law declaring that there is an official christmas tree, or religion or whatever and congress is able to do this, but not without impugnity and should be challenged. You're absolutely right, that is the correct way of celebrating Christmas. The practices I mentioned earlier are just the "secular" ways to celebrate the holiday. As a born-again Christian (used to be atheist), that was how we used to celebrate and still observe those practices. I know that many atheists still observe these traditions. In my opinion (just my humble opinion), atheists have no right to celebrate Christmas. I don't celebrate Ramadan or Khanukkah but I don't deny the Muslim's or Jew's right to do so. When atheists celebrate Christmas and yet deny Christ, well it's a little like saying "We'll celebrate St. Patrick's Day but I don't want to see anything Irish. No Shamrocks or Irish Flags. I'll go watch the parade and drink lots of beer but no GREEN beer". It's a little ironic, don't you think? Here's the catch 22 though that you are presenting. You've pointed out the secular ways to celebrate, but the country has given people little choice but to follow through with some of these (the whole not working thing comes to mind). And you are using the term a little too loosely, does it count that me, growing up jewish, "celebrates" christmas secular or otherwise by getting chinese food and seeing a movie? It's something I do annually on christmas and usually involves getting together with family, but I'm still well within my rights AND logic to demand that I would rather be spared the gimmicky religious crap that pops up.Your analogy only works if you ignore the religiousity that is christmas while st. patricks day has morphed into a celebration if Irish culture. Celebrating the culture of a specific people has no implication that you should join them (it's kind of impossible to). Unfortunately for you, finding a correct analogy would be attempting to find another religious holiday, that isn't christian, that America celebrates and goes crazy for. The closest you can get is Halloween, but even then we don't give people days off for that nor does the white house have an official costume. Hmm, you make some interesting points. You seem like a very intelligent person and i wish I could actually talk to you in depth about this instead of these blogs. When you think about it, the government really doesn't give us much choice in celebrating any official holiday. I was born in Ireland (live here in the US now) and every year, I am "forced" to take a holiday on July 4th. It's just another day to me, why should I be forced to celebrate that day. What if I said I was offended by the loud fireworks and all the red, white and blue (I'm not offended by any of it, just spitballing). Or if I said I was offended by the Thanksgiving holiday because I'm not American born (again, not offended, just sayin') None of us have any choice to NOT celebrate any of the official holidays. We do however have a choice whether or not we want to observe them and how we observe them. Like i said before, I will never deny the Jews, Muslims, Hindus or anybody else their right to celebrate their holidays. But why do atheists consistently try to deny the Christians their rights. We democratically elect these government officials, are we saying that once they become pubic servants, they can no longer practice their faith? Besides, the Christmas tree they erected is a symbol of the Christmas holiday, not the Christian faith. You are right to point out we don't really have a choice to at least observe that those days are different from other days, but you are using "celebrate" a little too loosely, or rather you are including celebration in the most passive sense (aka not going to work). And you are right, we are allowed the choice on how to observe national holidays, both religious and secular. What you are missing however is that atheist (well most atheists) aren't trying to ban christmas, that has never been their intent and any lawsuit, or grousing you see on this blog does not have the goal of abolishing christmas from the American landscape through legislation. When atheists like myself get annoyed about christmas, it's usually when the government is showing preferential treatment, NOT the representatives mind you, they are allowed, like you and me, to celebrate whatever they want, but in a federal capacity, to have an official tree is giving christianity, and certain types of christianity specifically, preferential treatment by recognizing their holiday by erecting a christian symbol on public land. If I had my druthers, the governement would be completely secular and during the holidays, representatives would go home and celebrate their holidays as they deem fit without me having to deal with a manger scene, an official christmas tree, the ten commandments in courtrooms, menorahs or kwanzaa holders inserted in places where they have no lawful reason to be there. There is an offical Menorah....they show it every year on TV. @Knight, you state "I know that many atheists still observe these traditions. In my opinion (just my humble opinion), atheists have no right to celebrate Christmas." To make this statement is the same as to claim Christians have no "right" to the pagan trees and wreaths associated with Christmas but stolen from prior religions. It would imply that Easter (didn't even change the name in English!) should not be celebrated, at least not with eggs or bunnies or buns...all stolen. But it would go further, since Christianity is just a modification of Judaism, ideas stolen and modified. The fact is that all of our ideas are derived from prior older ideas that were a part of our ancestors cultures. I would argue we all should have the same rights to the ideas and traditions of our shared histories that we want, because otherwise every belief system and ever set of rituals and celebrations falls like a house of cards. Yes we are getting close to celebrating one of the biggest delusions knownto man. And I'm willing to bet that you're one of the billions of people who will also engage in the gift giving/receiving raditions of the holiday. Stop complaining. It seems the non-believers go into a hysterical panic whenever anything that even remotely has to do with Christianity. You know darn well you will be participating in the holiday like everybody else around you. Don't even try to deny it. I celebrate Festivus not Christardmas. We celebrate Greedy Gift Getting season. What crime did this tree commit to get the death penalty?